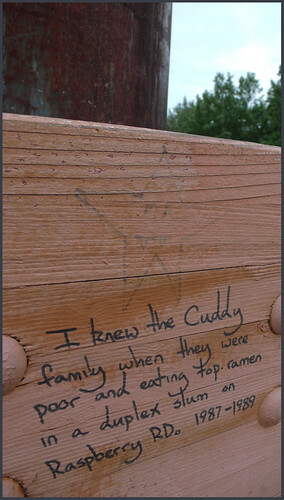 I spotted this neatly written graffiti message on a bridge railing in the city park the Cuddy Family bankrolled. I survived the Anchorage of the late 1980s — sort of — but I’m assuming the writer is referring to a different Cuddy family. [The real Cuddys were definitely not holed up in a rental eating survival food, as near as I can tell.] This other Cuddy Family is everyman — people who were around to witness every wonder of nature, every debacle and myth Alaska ever offered. I knew the Cuddy Family when…. …they could buy a politician for the price of a riding lawn mower. …they headed down the Stampede Trail with a .22 rifle and 10 lbs. of rice. …”the stars were aligned” politically in Alaska and the USA. …Anchorage turned to a miserly curmudgeon for leadership in time of greatest famine. …pot got more votes than the winning candidate at the top of the ticket. …”Secede or Succumb” was a popular bumper sticker. …lying on your resume’ was just good business practice [pre-internet era] — unless somebody found out you weren’t really ever on the City Council in Helena, Montana. …begging for change on a street corner was practiced by a happy soul who was the spiritual opposite of most of today’s haggard cardboard sign holders. …”cheating the other guy” was a funny idea [before we became the other guy]. …some clown wanted to turn us green! …we did not cut down living artifacts like “loop trees”. …we did not lust after chain restaurants. …a truck stop grew up to be a five mile long flea market. More later, as I think of them. I have to work now. Feel free to decode the ones above, or add some of your own. 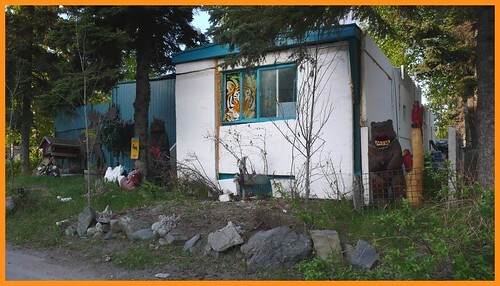 Tiger in a trailer, lower Spenard.